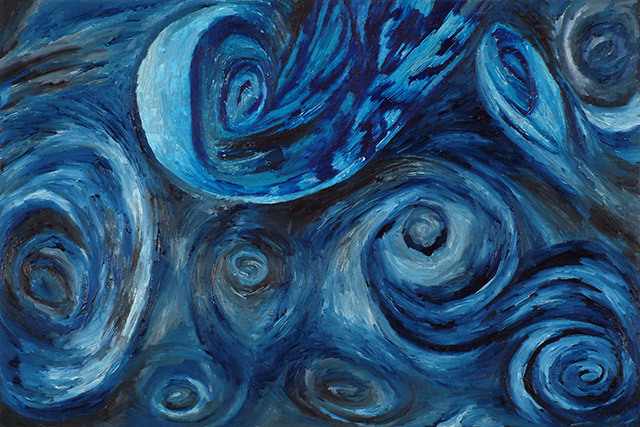 Clouds, galaxies, ocean waves and wild water turbulence of every kind were always endlessly fascinating to OUBEY. They’re an expression of the clash between the forces of chaos and order, the basic elements of all life. In the early 80s OUBEY developed a special technique to create brush-stroke-free multilayered swirls of turbulence on laminated hardboard. Later he sought to reemploy this technique in a series of paintings with oil on canvas. In May 2013 one of this series traveled to Maui/Hawaii to encounter Robby Seeger, a man intimately acquainted with the elemental forces of nature. He was only 12 when he first set his goal in life – to surf – not just any wave but giant waves, mighty walls of moving water 15 to 20 meters in height. And he was 16 when this dream came true: he flew to Maui where he became one the world’s best giant wave surfers and has never returned to Germany since. His encounter with this painting by OUBEY turned out to be an extremely emotional and searching quest. A man who has pitted his unprotected body a thousand times against the power of such an elemental force of nature as a giant wave doesn’t only have first-hand close up experience of the staggering force it unleashes. In the split-second quickness of his reactions – which can be a matter of life or death when riding the wave – he must have complete and utter confidence in his intuition and visceral feeling of a type denied to most people. And it was precisely this extraordinary trust in his own instinct which led him to give a perspective on this painting that was at first surprising, then clear and apparent and finally deeply revealing. A true voyage of discovery. I had a strange inkling of all this when I was preparing for my journey and wondering which of OUBEYs paintings I should take to Robby Seeger. My reason told me that that this picture was far too obviously the painting of a wave and as such wouldn’t be interesting enough for a viewer who spends the greater and most meaningful part of his life dealing with waves and riding them. Yet as I gazed into the painting, my own intuition and gut-feeling spoke up and told me that if there were anyone on earth who could see more in this painting than simply just waves, it would be a man to whom waves have become second nature. And that’s how it turned out. To have this painting taken to Maui, I had to have a new transport case built since the other air freight crates and cases were far too small. It’s the biggest of OUBEYs paintings ever to fly round the world and I’m very happy it had the chance to encounter Robby Seeger. And I think he feels the same way too.